Home / UncategorizedA beautiful family home in Hyderabad!! Think of India and the terms exotic and ethnic come to mind. The exotic angle is one that has been used by designers the world over – especially those touches that belong to the Indian school of design. Delicate Mughal type Jaali work and solid South Indian paintings that epitomise the beauty of temples, art and architecture can be found in all corners of the country. From North to South, and East to West, a unique charm marks the artistic landscape of each region, state and its people. 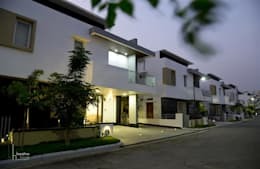 This home – a beautiful villa designed by the very talented team at Kreative House, architects in Hyderabad, for Mr Bhasker Reddy, is the epitome of all things Indian. Yet, this home has a strong modern canvas on which these elements meet. Take a tour and find out more! Indian history and its art as well as architecture are replete with stories and examples of luxury. Living life Maharaja style is a matter of simply adhering to lavish Indian design elements. This home is a modern ode to that very principle. 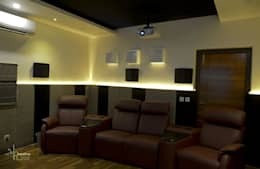 The Mughal motif stencils in gold dress up a plain white wall while a glossy niche in white stands in the centre with a sleek entertainment unit and TV. The white and gold scheme carries on throughout the home. Beige sofas in the living soften the effect and keep the art in constant focus. The opulent dining room lies just beyond this space with a shelf to separate the two. Set amongst a comfortable looking row of houses, the villa has a solid yet homely vibe from the word go. The tree lined street and calm neighbourhood do well to accentuate the pristine white façade and its neat lines. The home is well lit and has a well manicured look. Greenery lines one side of the driveway to create a well groomed and lush effect. 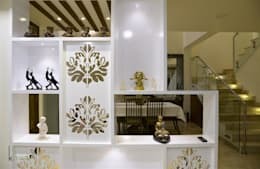 The Mughal motif makes an appearance in other corners of the living room and hall as well with a modern white shelf donning the stencilled art work. This shelf stands elegantly between the living and dining area. Ethnic statuettes from around the globe make this shelf a centrepiece of sorts. 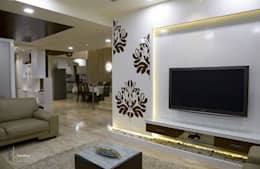 The home has various such niches and nooks with textured walls, lamps and other touches that heighten the sense of modern exotic luxuriousness. Glass, wood and chrome come together to create a stunningly visual effect here. 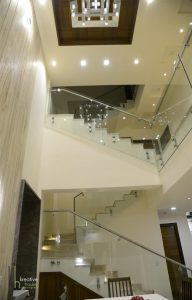 The staircase is an art installation of sorts that shows you the entire height of the home. It is a straight lined structure that is a very modern fixture in the scheme of things here. The modern looking lighting on top is recessed in a panel of wood and mirrors to create a focal point as one looks up. Lighting adds the finishing touches to this stunning area. The den has been done up with soothing lighting that accentuates the feeling of luxury as the sink in couches clad in leather literally invite you to shut the world out. Wooden arm rests and comfortable head rests create a warm vibe even as the mocha colour sits stylishly draped across the couches. While modernity is the mainstay of this home, precious touches of the exotic also line this villa and its designer environs. The home has been designed with the perfect balance of ethnic art and modern lines to make for a stunning look. ← Elegant and Luxury Walk-In Closet Ideas ! !